silversmiths. His father and grandfather were silversmiths. usually the topic was images he saw from the environment around him. would be in the valley grazing cattle during the winter. Dzilth-na-o-dith-hle, south of Bloomfield, NM. Barbara, who is also now his agent. all tribes have a common bond. Watercolor painting is his expertise but he is also skillful in pastels, acrylics, and sculpture. 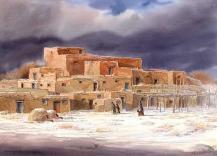 Mark was honored as the Indian Arts and Crafts Association Native Artist of 1986.